These homemade pork and beans are the perfect summer side dish. They’re healthier than traditional canned pork and beans, too! Turkey bacon and honey are the magic ingredients in this delicious backyard BBQ recipe. These healthy pork and beans are the perfect addition to my Healthy Baked Beans with Ground Turkey–perfect for summer! 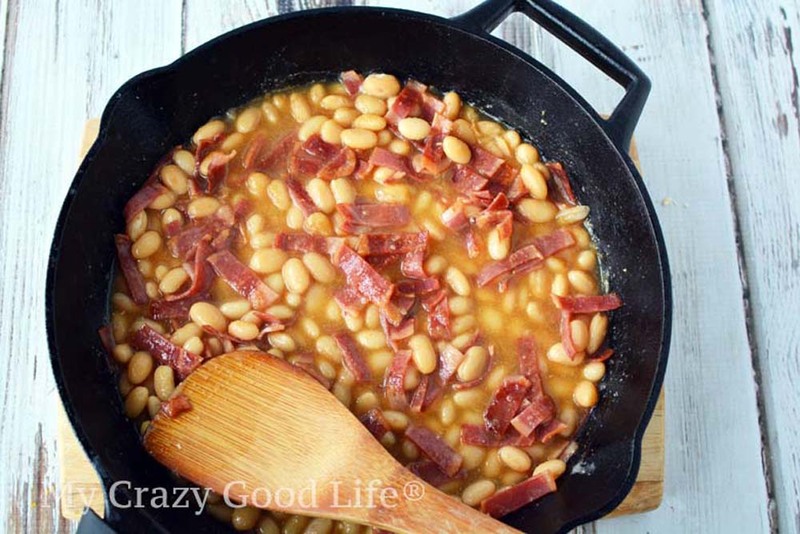 That sweet and smoky flavor of pork and beans is a unique one that many people love, but I never loved opening a can of beans that had sugars and meat in it. The molasses in this recipe is a great way to use a natural sweetener for that deep sweetness we all love in this recipe. Can you make these Homemade Pork and Beans in an Instant Pot or pressure cooker? Yes! I add them to the pot and cook on high pressure for 3 minutes. I love that the pressure cooker can quickly meld those flavors together. I’ve also made these on our smoker and the smoky flavor is amazing. I allow them to simmer for an hour on the smoker. How many calories are in these Homemade Pork and Beans? All of the nutrition information is at the bottom of the printable recipe for you! You can feel better about eating these because of the lower fat and sugar content. Why are these beans healthier than canned baked beans? Turkey bacon, while lower in fat than traditional bacon, is highly processed so there are conflicting views about if it’s really healthier than regular bacon. I find myself often using nitrate free center cut regular bacon and watching how much of it I eat. For the sake of this recipe I used turkey bacon, but you can definitely choose what works best for you. Can I have these homemade pork and beans with Weight Watchers? Sure! The great thing about Weight Watchers is that you can have just about anything as long as you track it. When you are tracking these healthy pork and beans you’ll need to track 6 Freestyle Smart Points per serving. 1. Add all ingredients to a medium sauce pot or large pan. I always spray my pans with olive oil before cooking, if you’re nervous about sticking you can use olive oil, as well. 2. Allow the pork and beans simmer for 45 minutes or so, stirring a few times so the beans don’t stick. If you’d like thicker beans, I leave the top off so some of the moisture can escape. If you’re not worried about thick beans I’d leave the top on. 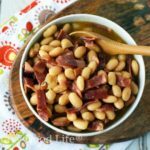 These are tough to under or overcook because of the canned beans, so it’s ok to allow them to simmer longer or less time. You’re just waiting for the spices and bacon flavors to meld together. I love allowing these to simmer on low on our smoker for a deeper flavor. I usually do this for at least an hour. 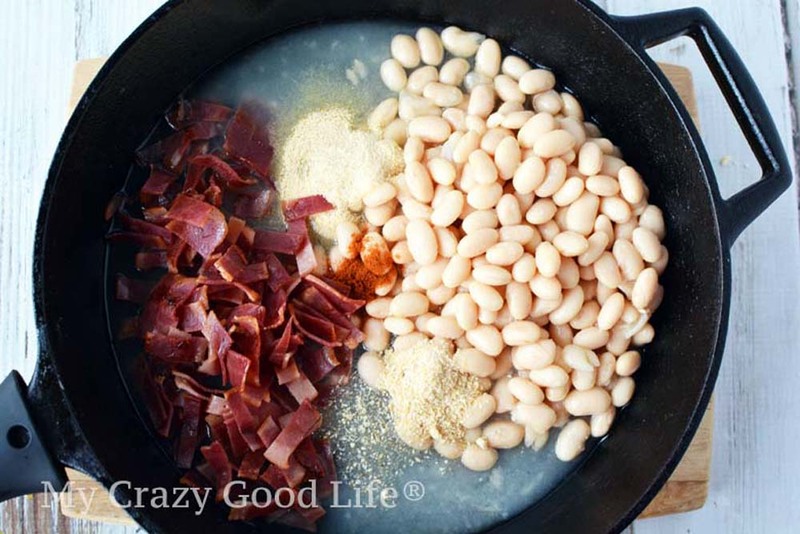 Use these beans in traditional baked beans recipes, or as their own side dish. You can use these however you’d use traditional canned pork and beans. Can you freeze these pork and beans? You certainly can freeze these. I’d recommend freezing in single servings after they’ve cooled and in freezer safe bags or containers. You can simmer the beans on the stove or in the microwave to reheat. I love making freezer staples like these pork and beans, cream of mushroom soup, and brown rice so that I always have healthier alternatives to prepackaged foods in my house. These homemade pork and beans are the perfect summer side dish. 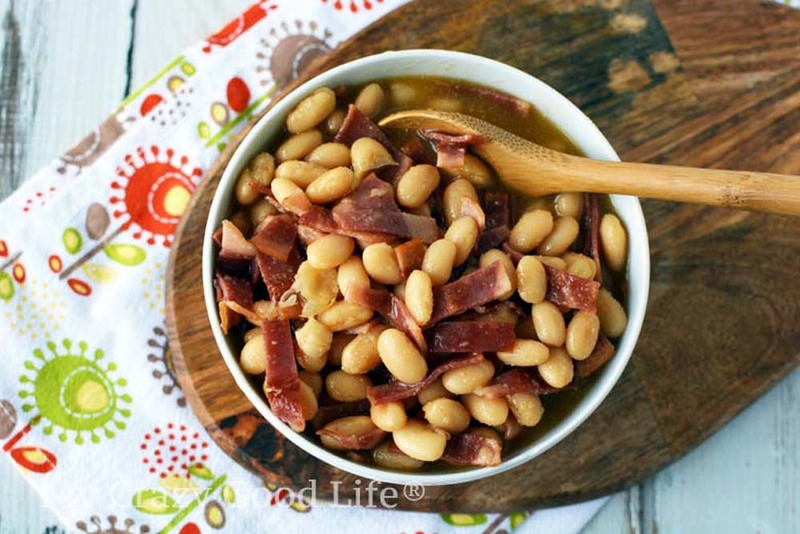 They're healthier than traditional canned pork and beans, too! Turkey bacon and honey are the magic ingredients in this delicious backyard BBQ recipe. 8 slices turkey bacon or nitrate free bacon cooked, but not crispy. Cut into small pieces. 1. Add all ingredients to a medium sauce pot or large pan. I always spray my pans with olive oil before cooking, if you're nervous about sticking you can use olive oil, as well. 2. Allow the pork and beans simmer for 45 minutes or so, stirring a few times so the beans don't stick. If you'd like thicker beans, I leave the top off so some of the moisture can escape. If you're not worried about thick beans I'd leave the top on.